Last week I was in Macedonia. I have been there so many times I have loved working there for almost 20 years now. Its an amazing country and we get to work alongside some amazing Christians leaders to reach this nation, that came into being after the breakup of Yugoslavia in the 90’s. It’s a small country of just over 2 million people. Few Christian churches are in most cities and many towns have NO Christian churches. Working alongside these Christian leaders there we are helping to change this. This nation, that is about 30% Muslim/Albanian, getting to know Jesus in more that just a “historical figure”, but the person who can change their lives. 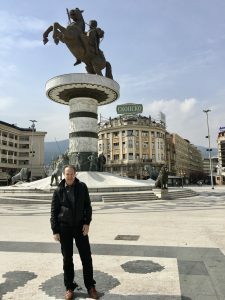 In this picture I am in one of the central squares in Skopje in front of the ALEXANDER THE GREAT statue, who was Macedonian. 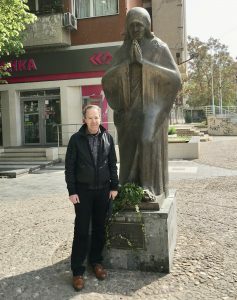 One of the neat things about Macedonia is in the Capital city, Skopje, is the birthplace of Mother Teresa. I’ll bet you didn’t know that, did you? She was born in Skopje in 1910 and moved to Ireland in 1928 to attend a convent. There is a museum and many statues of her in the city. So Macedonia is just one of over eleven countries we work in and are seeing great things happen. Thank you for all your do to help us do this. We are well aware that we could not do it with your help.